Want to get married in multiple languages or in unusual conditions? Skydiving, perhaps? As any bride knows, the officiant is an absolutely essential piece of the wedding puzzle. But finding that special officiant – you know, the one that makes you feel like instant best friends – is tougher than it sounds. If you want to get married in multiple languages or in unusual conditions (skydiving marriage, anyone? ), it’s even harder to find. 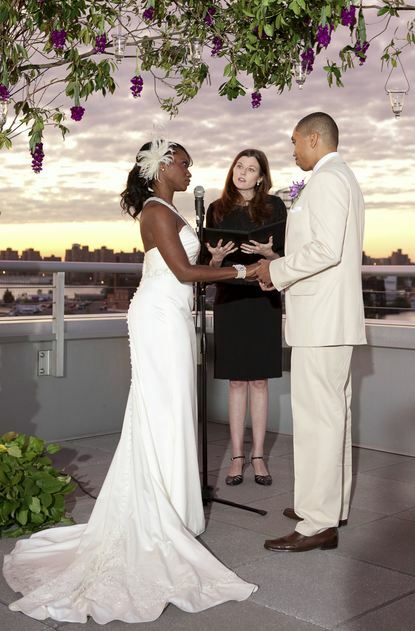 Thankfully, you’ve got Urbanette to rely on, and we found the perfect wedding officiant for you. Kimberly Worley answers a few questions about the craziest weddings she’s officiated. Urbanette Magazine: You have officiated some of the most interesting (and odd) wedding rites and in effect created a niche for yourself for unique New York weddings. How extraordinary have the rites been since you started? Kimberly Worley: I have officiated weddings in six different languages (Thai, Italian, and French to name a few). 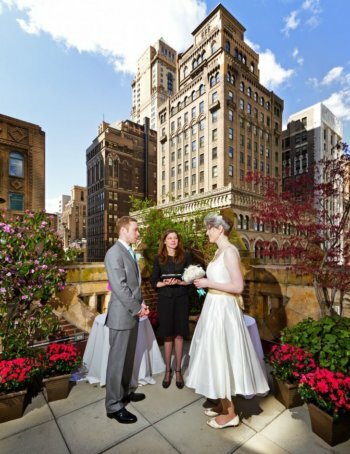 I’ve officiated weddings in a jail, on the stairs in Times Square, at the Top of the Rock, on a boat in front of Statue of Liberty, all over Central Park, and in so many of our beautiful hotels and specialized venues all over the city. The quirkiest one I have officiated, was a wedding where I performed the wedding scene from the Princess Bride. They were all unique in their own rights and had been so much fun. We love New York, and all the unique people that live and come here for their own one-of-a-kind ceremony. I love hearing stories of people who found love later in life, over the internet, after loses, or over long distances. It gives me a sense of hope that everyone can find love at any time in their lives and despite any barriers that might seem too big to overcome. Urbanette: You’ve done weddings in languages you don’t even speak. Can you tell us about this experience? Kimberly: One of the best things about NYC is all the cultures here. I have officiated ceremonies with just a few sentences in another language and others with the whole ceremony in another language. I just write it out phonetically and practice and practice. I have done an entire ceremony in Italian and I did not speak a word of it. I actually received compliments on my Italian accent, which was really nice to hear because you always want to provide the best memories for people. It no doubt raises my anxiety level and I get many strange glares from my husband and son at first but now they know it’s just part of my crazy fun job. Urbanette: How involved are you with the entire wedding process? How much assistance do you give to foreign couples eloping? Kimberly: I am very involved in the wedding process, especially when the couple does not have a planner. I have done this so many times that, coming from being a teacher, I have no problem directing traffic, calming the bride, and telling everyone where to stand and what to do. It always really puts my brides at ease when they have someone that help them out with all the decisions and last minute surprises that arise. I give couples great suggestions of wonderful vendors I have worked with all over the city and all the venues I have encountered. I also love the idea of using ETSY.com. They have so many wonderful and creative wedding items. It’s so hard to plan a wedding when you don’t live here. I work with couples who live out of the state and out of the country all the time. I sometimes feel like a wedding planner when I am dealing with couples who don’t live here. It’s really nice to know that I have helped make it a more relaxing experience, I know it can be stressful to plan when you don’t live here. Urbanette: How do you incorporate specific cultural or special preferences by the couple? Kimberly: Every culture has great wedding traditions. Many couples like to incorporate small aspects into their ceremony rather than the whole ceremony. I love the Serbian tradition where the groom has to shoot an apple out of tree with a rifle in order to win the right to marry the bride. We really can’t do that tradition here in NYC. There are so many interesting ones that I get to learn about. Couples also are coming up with great new and creative ideas all the time. I tell couples all the time that they should do exactly what they want, it is great to be original because it makes it into your own wedding. 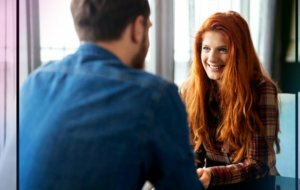 Urbanette: Have you ever encountered “objections” by third parties to the couples during the ceremony? Kimberly: Luckily, I’ve never had any objections. I wouldn’t have wording in any of my ceremonies that asks if anyone objects to the ceremony. That would be so horrible for someone to do that, even as a joke. Urbanette: What is your dream wedding? Kimberly: I would love to marry a couple in a helicopter, or sky diving.